Aim: To assess the prevalence of oral precancerous lesions and conditions and to determine the potential risk factors associated among general population aged 20-70 years of Telangana region, Andhra Pradesh. Materials and Methods: An oral screening campaign was organized with the help of local general dental practitioners in each district. All the relevant information regarding the subject was documented and clinical examination of the oral soft tissues was carried out. Clinically diagnosed as precancerous lesion or condition were subjected to punch (incisional biopsy) biopsy and evaluated histopathologically to confirm the diagnosis. Results: Among 1200 screened, 150 subjects were chewers and 136 subjects were smokers with 29 chewers and 16 smokers had precancerous lesions and conditions. An overall prevalence of oral precancerous lesions and conditions were found to be 4.2% (males 5.5%; females 2.5%). Leukoplakia was seen in 0.8%, Oral submucous fibrosis in 1.3% and lichen planus in 2% of the study population. Conclusions: The prevalence of precancerous lesions and conditions in our study is higher when compared with the reports from different parts of the country and in South East Asia. These lesions can be prevented from malignant transformation by mass screening, close monitoring, early detection, appropriate treatment plan and prognosis. There are already indications in India of an increased occurrence of oral precancerous lesions and conditions due to change in life style. There is a steep rise in smoking and chewing habits and this is likely to reach an alarming proportion in the near future. This implies that oral cancer occurrence would also increase simultaneously. The malignant transformation rate of most of the precancerous lesions and conditions are high. Through mass screening, close monitoring, early detection, appropriate treatment plan and prognosis these lesions can be prevented from malignant transformation. Hence, the present study was undertaken to assess the prevalence of oral precancerous lesions and conditions and also determine the potential risk factors among general population aged 20-70 years of Telangana region, Andhra Pradesh. A cross-sectional descriptive epidemiological study on prevalence of precancerous lesions and conditions was carried out among the general population residing in Telangana region. Telangana has a total population of 35,286,757 (2011 census), which is 41.6% of Andhra Pradesh state population. Permanent residents, aged 20-70 years with no gender discrimination and without any previous history of treatment for any type of oral diseases and having the habit for at least a year or more were selected for screening. Subjects with previous history of hospitalization for any systemic illness, immuno-compromised patients, and patients with recurrence of the primary lesions and multiple oral and/or head and neck lesions were excluded. Our research was conducted in full accordance with the world medical association declaration of Helsinki. The study protocol was reviewed and approved by the Institutional Ethical Committee. Written informed consent was obtained from all the study participants after explaining the nature and purpose of research. Based on the prevalence obtained in the earlier studies, 95% confidence level and 10% allowable error, the sample size was determined as 1171 which was rounded off to 1200. The study was conducted during August to October 2012 and the sample were selected by a multistage stratified random sampling procedure. Telangana region consisting of 10 districts was divided geographically into five areas; North-East, North-West, South-East, South-West and Central. In the first stage, 2 districts were randomly selected from each geographic area. List of all the blocks from the 2 selected districts was obtained from Census Enumeration Areas Data. In the second stage, 3 blocks were selected randomly from each ward. In the third stage, door to door survey was conducted and around 120 individuals, aged 20-70 years were interviewed and examined from each block. A total of 1293 subjects were approached to participate in the study, but 93 declined citing a variety of reasons (response rate 92.8%). The clinical diagnosis of the precancerous lesions and conditions were done as per the WHO (1997) criteria. All the relevant information regarding the subject was documented in a standard format and clinical examination of the oral soft tissues was carried out. Punch (incisional) biopsy was performed for confirmation among the subjects who were clinically diagnosed of precancerous lesion or conditions. The tissue specimen was stored in 10% formalin and routine tissue processing was done in the histopathology laboratory, Department of Oral and Maxillofacial Pathology, Panineeya Mahavidyalaya Institute of Dental Sciences, Hyderabad and stained with hematoxylin and eosin. The stained soft tissue section was then observed under binocular light microscope (OLYMPUS CH 20i olympus India pvt. Ltd, New delhi) and a thorough histopathological evaluation of the stained sections were done. Cases confirmed through histological examination were only considered as positive and included in the analysis. The recorded data were compiled and entered in a spreadsheet computer program (Microsoft Excel 2007) and then exported to data editor of SPSS version 15.0 (SPSS Inc., Chicago, Illinois, USA). The variables were assessed for normality using the Kolmogorov-Smirnov test. Descriptive statistics included computation of percentages, means and standard deviations. Chi-square test and logistic regression analysis were used for comparisons. Multivariate analysis was used to assess the relative importance of independent variables and to identify the main variables influencing precancerous lesions and conditions. Statistical significance was set at P ≤ 0.05. The study group consisted of 1200 subjects, 674 (56.2) males and 526 (43.8) females and were divided into 10 year interval age groups 20-29, 30-39, 40-49, 50-59, 60 years and above. The maximum subjects (33.9%) were under 30-39 years and the minimum number of subjects (4%) was in 60 years and above age group [Table 1]. An overall prevalence of precancerous lesions and conditions was 4.2%, which was significantly higher among males (5.5%) when compared to females (2.5%) (P = 0.00943). Prevalence according to gender was leukoplakia 0.8%, OSMF 1.3% and lichen planus 2%. The OSMF was not found in females and lichen planus showed equal distribution [Table 2]. The total number of chewers and smokers were 150 and 136 respectively out of 1200 subjects. 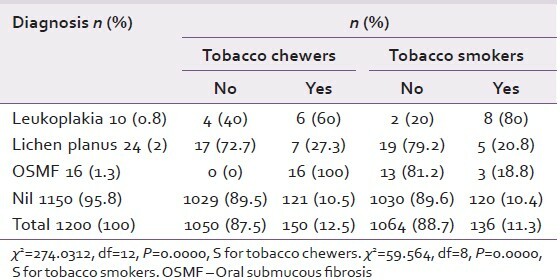 Out of 150 tobacco chewers, 29 (12.5%) subjects had precancerous lesions and conditions and OSMF was the most prevalent precancerous condition (P = 0.000). Out of 136 smokers, 16 (11.3%) subjects had precancerous lesions and conditions and leukoplakia was the most commonly found precancerous lesion (P = 0.000) [Table 3]. Logistic regression was performed in order to assess whether chewing and smoking tobacco was associated with oral precancerous lesions and conditions [[Table 4] and [Table 5]]. Based on the analysis a statistically significant association with oral precancerous lesions and conditions with the duration of both chewing and smoking tobacco (P < 0.05) was observed. It is widely understood that neither do all precancerous lesions progress to cancer nor all cancers necessarily originate from such lesions, but it has been proved that the majority of these lesions and conditions progress to cancer unless diagnosed early and treated. In our study the overall prevalence of precancerous lesions and conditions were 4.2% which is almost similar to the studies done by Warnakulasuriya et al., in the year 1984 (4.2%),  Rao et al., in 1998  (3.98%), and Lim et al., in 2003  (4.2%). In contrast, our prevalence of lesions and conditions were much higher when compared with the study done by Bhonsle et al., in 1976  (1.78%), suggesting that there is a slight regional variation in occurrence of the disease. The general agreement has been that OSMF occur usually between third and fifth decade of life. In a study by Murti et al. maximum numbers of subjects were from 35 to 44 years and 45-54 years age group, but in our study the maximum number were in third decade, which is similar to the study by Hazarey et al. This may imply that apart from habits, stress also plays a major role in occurrence of OLP. Considering the individual lesions in our study, first, leukoplakia showed an overall 0.8% prevalence, which was almost similar to the studies done by Saraswathi et al., in 2006  (0.6%), but in contrast to a study by Bhonsle et al., at Goa in 1976  (1.6%), which could be due to a variation of habits between the study groups. Second, prevalence of OSMF in our study is significantly higher than the other studies, done by Pindborg et al., at Lucknow (0.5%), and Trivandrum in 1965  (0.9%),  and Saraswathi et al., at Chennai in 2006  (0.55%). This could be due to an increase in the popularity of commercially available tobacco products over a period of time. Finally, the prevalence of lichen planus is 2% in our study, which is higher in contrast to the studies done by Lay et al., at Bilugyum in 1982  (0.4%), Saraswathi et al., at Chennai in 2006  (0.15%), which could be due to the change in life style and increased stress level of the individuals. Ideally substantiation of the etiological role of tobacco should be sought from population-based cross-sectional, prospective, and intervention studies. Cross-sectional studies provide evidence in the form of prevalence rates of leukoplakia among people with and without tobacco habits as well as the influence of different kinds of habits. New concepts and better understanding of this precancerous lesions and conditions would be a gain for the successive studies and we consider our study one among those genuine efforts in this direction. The widely prevalent arecanut chewing habit in various forms is a matter of concern for many health professionals involved in the work on oral cancer. The pattern of chewing habits among the study groups gave us an insight into the lifestyle of the population and the statistics thus obtained in this study can serve as a valuable source of data to plan and implement various health programs for the community. The preventive approach is therefore clear for oral cancer and precancers and all health care professionals have an obligation and an excellent opportunity to contribute. As India aspires to become a developed country in the near future its achievement in the social arena will be seen with equal interest as its economic and scientific advancement. Hence, the young health professionals have a major responsibility in ensuring a healthy nation. 1. Lim K, Moles DR, Downer MC, Speight PM. Opportunistic screening for oral cancer and precancer in general dental practice: Results of a demonstration study. Br Dent J 2003;194:497-502. 2. Johnson NW, Jayasekara P, Amarasinghe AA. Squamous cell carcinoma and precursor lesions of the oral cavity: Epidemiology and aetiology. Periodontol 2000 2011;57:19-37. 3. Petersen PE. Oral cancer prevention and control - The approach of the World Health Organization. Oral Oncol 2009;45:454-60. 4. Yang YH, Ho PS, Lu HM, Huang IY, Chen CH. Comparing dose-response measurements of oral habits on oral leukoplakia and oral submucous fibrosis from a community screening program. J Oral Pathol Med 2010;39:306-12. 5. Daftary DK, Murti PR, Bhonsle RB, Gupta PC, Mehta FS, Pindborg JJ. Oral precancerous lesions and conditions of tropical interest. In: Prabhu SR, Wilson DF, Daftary DK, Johnson NW, editors. Oral Diseases in the Tropics. Oxford: OUP; 1992. p. 402-28. 6. van der Waal I. Potentially malignant disorders of the oral and oropharyngeal mucosa; terminology, classification and present concepts of management. Oral Oncol 2009;45:317-23. 7. Ramesh V, Meena, Pardeep K, Mohan, Mukesh, Shankar P, et al. Prevalence of tobacco use and its correlate factors among school going adolescents in rural areas of Haryana, India. Indian J Public Health Res Dev 2011;2:142-6. 8. Government of India, Ministry of Home Affairs. New Delhi: Office of the Registrar General and Census Commissioner, India; c2010-11. Census of India 2011, Our Census, our Future. Available from: http://censusindia.gov.in/. [Last cited on 2011 Sep 24]. 9. Javed F, Tenenbaum HC, Nogueira-Filho G, Nooh N, O'Bello Correa F, Warnakulasuriya S, et al. Periodontal inflammatory conditions among gutka chewers and non-chewers with and without prediabetes. J Periodontol 2013;84:1158-64. 10. Javed F, Näsström K, Benchimol D, Altamash M, Klinge B, Engström PE. Comparison of periodontal and socioeconomic status between subjects with type 2 diabetes mellitus and non-diabetic controls. J Periodontol 2007;78:2112-9. 11. World Health Organization. Oral Health Surveys, Basic Methods. 4 th ed. Geneva: 1997. 12. Warnakulasuriya KA, Ekanayake AN, Sivayoham S, Stjernswärd J, Pindborg JJ, Sobin LH, et al. Utilization of primary health care workers for early detection of oral cancer and precancer cases in Sri Lanka. Bull World Health Organ 1984;62:243-50. 13. Rao SP, Bhowate RR. Community based oral precancerous lesions/conditions: An analysis of associated factors. Indian J Otolaryngol Head Neck Surg 1998;50:261-5. 14. Bhonsle RB, Murti PR, Gupta PC, Mehta FS. Reverse dhumti smoking in Goa: An epidemiologic study of 5449 villagers for oral precancerous lesions. Indian J Cancer 1976;13:301-5. 15. Saraswathi TR, Ranganathan K, Shanmugam S, Sowmya R, Narasimhan PD, Gunaseelan R. Prevalence of oral lesions in relation to habits: Cross-sectional study in South India. Indian J Dent Res 2006;17:121-5. 16. Pindborg JJ. Frequency of oral submucous fibrosis in North India. Bull World Health Organ 1965;32:748-50. 17. Murti PR, Daftary DK, Bhonsle RB, Gupta PC, Mehta FS, Pindborg JJ. Malignant potential of oral lichen planus: Observations in 722 patients from India. J Oral Pathol 1986;15:71-7. 18. Hazarey VK, Erlewad DM, Mundhe KA, Ughade SN. Oral submucous fibrosis: Study of 1000 cases from central India. J Oral Pathol Med 2007;36:12-7. 19. Pindborg JJ, Chawla TN, Misra RK, Nagpaul RK, Gupta VK. Frequency of oral carcinoma, leukoplakia, leukokeratosis, leukoedema, submucous fibrosis, and lichen planus in 10,000 Indians in Lucknow, Uttar Pradesh, India; preliminary report. J Dent Res 1965;44:61. 20. Pindborg JJ, Zachariah J. Frequency of oral submucous fibrosis among 100 South Indians with oral cancer. Bull World Health Organ 1965;32:750-3. 21. Lay KM, Sein K, Myint A, Ko SK, Pindborg JJ. Epidemiologic study of 600 villagers of oral precancerous lesions in Bilugyun: Preliminary report. Community Dent Oral Epidemiol 1982;10:152-5. 22. Bánóczy J, Rigó O. Prevalence study of oral precancerous lesions within a complex screening system in Hungary. Community Dent Oral Epidemiol 1991;19:265-7. 23. Carrozzo M, Thorpe R. Oral lichen planus: A review. Minerva Stomatol 2009;58:519-37. 24. Shah N, Sharma PP. Role of chewing and smoking habits in the etiology of oral submucous fibrosis (OSF): A case-control study. J Oral Pathol Med 1998;27:475-9. 25. Bathi RJ, Parveen S, Burde K. The role of gutka chewing in oral submucous fibrosis: A case-control study. Quintessence Int 2009;40:e19-25.